As part of our 75th anniversary celebrations this year, we recently asked you, our users, to nominate your favourite ERO documents. Thank you very much to those of you who have sent in nominations so far – today we bring you the next in a series of your favourites. Today’s nomination comes from Richard Morris, one of the Verderers of Epping Forest, a post that has existed for nearly 1,000 years to protect and administer the forest. 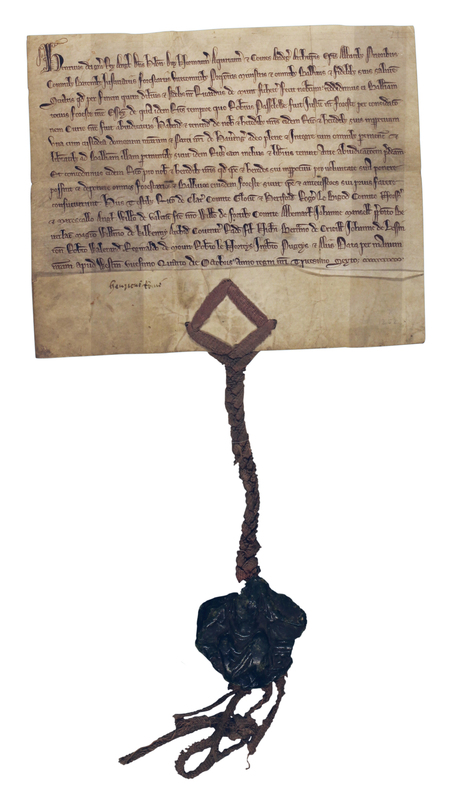 Richard’s nominated document is D/DCw T1/1, a deed of the Royal Forest of Essex dating from 1252. This is one of the earliest surviving deeds of the Royal Forest of Essex, later Waltham Forest, of which Epping Forest is today the remaining fragment, albeit still covering over 6,000 acres. The deed, dated 1252, refers to the restoration from King Henry III to Richard Muntfichette of the office of bailiff of the Forest of Essex, which he had lost when the infamous Robert Passelew was Judge of Forest Pleas. The signatories to the deed, which includes part of the Great Seal of Henry III, include the Earl of Gloucester, the Earl of Norfolk (Marshal of England), William de Valence, the King’s brother, and the Earl of Albermarle. The deed is one of the most important concerning the history and administration of the Forest of Essex. Thank you to Richard for nominating this early document concerning one of Essex’s most notable historic landscapes. If you would like to nominate your own favourite ERO document, we would love to hear from you. Simply download this form, and return it to the Searchroom desk or by e-mail to hannahjane.salisbury[at]essex.gov.uk. There are also paper copies available at the Searchroom desk. Nominated documents may be featured on this blog or in displays at our open day on Saturday 14 September 2013. This entry was posted in Archives, Collections, Essex history, Family history, Local history and tagged Epping, forest, medieval, seal, Verderer by admin. Bookmark the permalink.